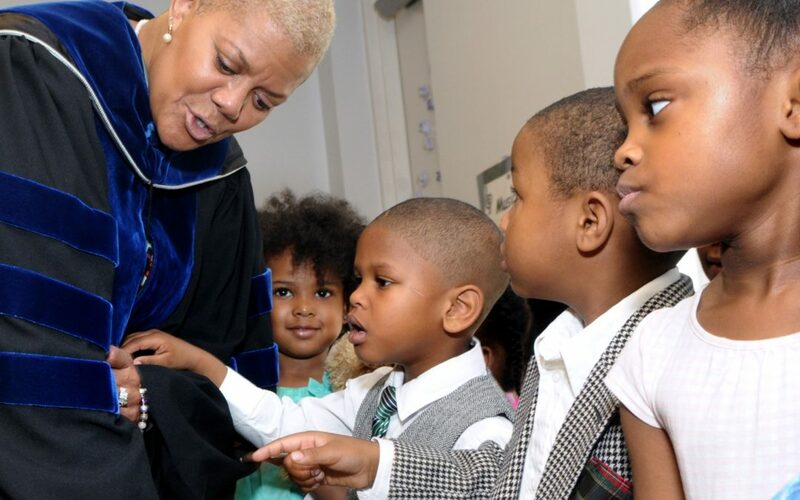 Dr. Chisholm wore the cap, gown and hood she earned after completing her Ph.D in psychological anthropology at Case Western Reserve University to address children and their families at the Louis Stokes Head Start Moving On Ceremony this month. She passionately told the crowd that the move from Head Start to Kindergarten is just the first of many transitions and graduations these students will celebrate. Her message was met with cheers from the crowd. Each Head Start center has its own Moving On ceremony, where parents, friends and teachers celebrate each student’s accomplishments that year. There is singing, cheering and non-stop picture taking. After the ceremony, many students receive balloons, flowers and stuffed animals as congratulatory gifts. But for many, the moment is bittersweet, as classmates and staff say “goodbye” to the students starting Kindergarten. Just because a student is leaving Head Start for Kindergarten doesn’t mean the relationship ends between the family and The Council for Economic Opportunities. The organization encourages parents and guardians to continue to engage and learn through personal, family and professional development workshops offered through three Neighborhood Opportunity Centers throughout the summer months. Parents and guardians can also register for the coming year’s Head Start class. There are three easy ways to enroll: visit ceogc.org, sign up at any Head Start center or call the Head Start enrollment hotline at (216) 589-9922.